With Jessica Rizzo’s Sister Sandman Please, the Yale Cabaret showcases the kind of experimental work that, in many ways, the basement theater does best. While it’s always worthwhile to see small-scale productions of new or lesser known plays, or devised pieces that bring together various aspects of community to tell stories of our times, a play like Sister Sandman uses the space to present a wholly theatrical and relational work. We’re watching a form of playing that plays with how plays—and audiences—are played. The most definite aspect of Sister Sandman Please is how Rizzo and her crew remind us that “setting” and “stage” in a play is not simply the visual, physical space, but is also the aural. And while last week’s show, The Medium, an opera, demonstrated how well music and singing can enhance and expand acting, this week’s show makes a further point: what we hear not only interacts with what we see, but can, through recordings, create alternative features, other presences. 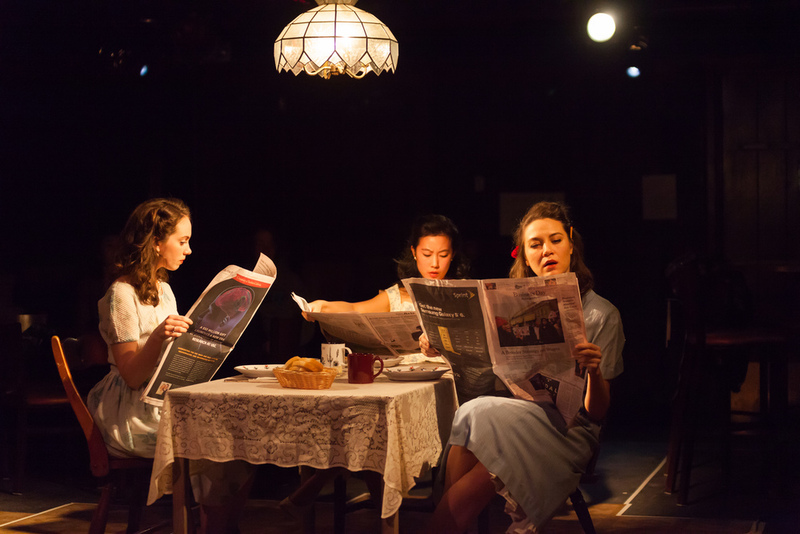 The “story” centers on three sisters—A (Ashley Chang), B, or Minnie (Sydney Lemmon), C, or Ada (Baize Buzan)—who sit at a breakfast table, passing around different sections of the New York Times. The soundtrack, initially, is a loop of crunching sounds occasionally broken up by comments and mutterings. There is a tension here as of persons who know one another only too well and can “hear” the unspoken things in each others’ minds. At times there are verbal outbursts between the three, and eventually a veritable Marlboro man of a cowboy, Wiley McDrew (Ben Graham), arrives to spark rivalries. “A” immediately flies to his arms and makes out with him passionately, but that, we assume, is just a fantasy. He’s really more interested in C, who he courts in a more laconic fashion, while her sisters wrestle on the floor and Minnie makes goo-goo eyes at him. The action is accompanied by aural overlays that create textures and moods that are difficult to describe. Sometimes it’s a monologue, as when a voice (Anna Crivelli) starts talking about her tumbleweed business on the internet. Tumbleweeds are used to create a Christmas tree of sorts and “A” dons Christmas lights, answered by a string of lights on Wiley. And yet the match doesn't come off, so she convulses on the floor, and Ada, who walks about stirring a big pot, eventually becomes the sister who is “expecting.” “A” proceeds to drown her sorrows at some length, drinking from a bottle of whiskey while prone on the floor. Indeed, Chang nearly runs away with the play as her show-stopping, unhinged belting of “O Holy Night,” while perched on the table top, is funny, visceral, and oddly charming, a Christmas carol as torch song. The others hold their own—Lemmon seems to be the oldest sister, the kind of heroine one might find in a frontier story or in some naturalistic drama set in the Midwest: her prop is a clipboard and a managerial air. Buzan plays up the country lass manner, all-too-ready to be the new mom left behind by that rolling tumbleweed of a man. She wants to know what color crayon she should give their son to color with. Clad in a vampire cape and fangs, Wiley McDrew is given his send-off as though by a trio of moms sending him off to school. Accompanying the live action and the recordings is Christopher Ross-Ewart on electric guitar and vocals. His contribution is subtle at first, but by play’s end the swirling sustain of his guitar begins to override the action. The trio sits again at the table, now with suitcases full of newspapers, and the tone is elegiac but also uplifting. What has happened, what have they learned? We might think of three fates or furies or of sisters who always dreamed of Moscow, but, however we regard the return with a difference, the close feels open-ended. At the most basic level, their lives have been changed irrevocably, because a child is on the way, but they are also the same as they were before, living out the repetitive figments of their own existences. The setting—a country-kitchen table, a floor of linoleum—is spare, the tumbleweed Christmas tree is comical but also an art sculpture, the costumes are “country gal.” Elizabeth Green’s lighting directs our visual attention while loops of sound effects, voices, and other textures create a more impressionistic aura. Sister Sandman Please may sound rather enigmatic when described, but while watching it, one is struck again and again by surprising and intriguing shifts in tone and implication. Coherence is mannerism; the inchoate occurs.